The Environmental Protection Agency (EPA) has recently released a final rule which creates an exemption for Monsanto. It allows a higher level of residue tolerance in GMO foods and Bt toxins. This particular exemption allows residues of the bacterium Bacillus thuringiensis, commonly known as Bt in genetically modified food like soy, but similar exemptions have already been ruled for cotton and corn. A final rule, they say. Not if enough of us stand up to the infestation of our government agencies by biotech companies. 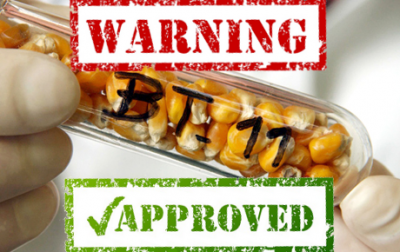 Bt toxins have been used in agri-business for decades. I refuse to call it agriculture, because that is the cultivation of healthy food for people throughout the world. This is something else, entirely. Bt toxins have been linked to multiple, serious diseases in independent scientific studies, and one of the latest points out that it even targets human embryo cells, killing them upon contact. Along with being reproductively toxic, Bt has also been linked to leukemia in a study published by the Journal of Hematology and Thromboembolic Diseases, and was the background for millions of farmer suicides in India. It is not safe, though the EPA and FDA keep telling us so. Does anyone listen to these morons anymore, anyhow? They’ve completely discredited themselves, and everyone knows that Monsanto has deep tentacles in these agencies. David W. Beier . . . The former head of Government Affairs for Genetech, Inc. was the chief domestic policy advisor for Al Gore. Linda J. Fisher . . . The former Assistant Administrator of the US EPA’s Office of Pollution Prevention, Pesticides, and Toxic Substances is now Vice President of Government and Public Affairs for Monsanto Corp.
Michael A. Friedman, M.D. . . The former acting commissioner of the US FDA Department of Health and Human Services is now senior VP for clinical affairs at G. D. Searle & Co., a pharmaceutical division of Monsanto Corp. The list goes on and on, and I suggest you peruse it more closely if you want to see just who is in bed with biotech. (Just check out the links above). Bt toxins, called the Cry1F protein, were genetically insinuated into every cell of GMO plants to protect them from insects like the corn borer and cotton bollworm. We and our livestock ingest these Cry1F proteins, and it isn’t good, to say the least. Just what did the EPA base their determination upon, besides fat checks from biotechs? They say, “there is a reasonable certainty that no harm will result from aggregate exposure to the pesticide chemical residue, including all anticipated dietary exposures and all other exposures for which there is reliable information.” They include exposure to Bt toxins through drinking water. The docket for this action, identified by docket identification (ID) number EPA–HQ–OPP–2013–0704, is available at http://www.regulations.gov. Any objections to the final rule and/or a request for a hearing must be filed by April 14. If we stand together we can undo this slaughter of the natural world and humankind. Please call, write, and pester your politicians, as well as US EPA and US FDA officials to tell them you won’t stand for it. They need to remove the words ‘environmental’ and ‘protection’ from their name and just become an agency for graft, corruption and greed like all other governmental organizations. If you hate them so much, why not get a college degree and go work for them? Or maybe it’s easier to sit smugly with arrogance of ignorance, spitting your lack of backbone on some hokey website. Like you do? What a joke you are. It allows a higher level of residue tolerance in GMO foods and Bt toxins. What are they?